Meetings are held on the first Thursday every month at 6:30 p.m. The February meeting is February 7 at the 4th Avenue Grill in Logan. All Democrats welcome. We will be electing county officers for 2019. It’s easy to claim to love democracy when your own side is winning. When your party is losing, though, then you tend to show your true colors. Since the election of 2018, we’ve had plenty of opportunities to see what Republicans think of democracy when it really counts, and the results aren’t pretty. Republicans rammed through a long list of laws in Wisconsin aimed at preventing the incoming Democratic governor from doing what the voters elected him to do. They’ve done something similar in Michigan. In North Carolina, there may be a new election because of blatant Republican voter fraud. Their contempt for democracy could not be more clear. The fact is that the G.O.P., as currently constituted, is willing to do whatever it takes to seize and hold power. And as long as that remains true, and Republicans remain politically competitive, we will be one election away from losing democracy in America. Voter-approved state laws are also under attack. Missouri’s constitutional amendment to prevent gerrymandering, Florida’s restoration of voting rights to ex-convicts, and a medical marijuana measure in Utah are all being “slow walked” by Republicans or outright replaced by legislation not approved by voters. One partial solution Democrats should pursue, is to change state constitutions so that there can be no monkey business during the lame duck session, because there is no lame duck session. Let the term of every legislator end on election day. The same should be done at the federal level. Let’s talk about another member in good standing of the Republican Party, Montana Rep. Greg Gianforte. He’s a convicted violent criminal. In May 2017, the day before a congressional special election in Montana, Republican Greg Gianforte, physically assaulted a reporter…. The Guardian‘s Ben Jacobs pressed Gianforte with a substantive question about health care policy, and the GOP candidate responded by attacking the journalist, throwing him to the ground, and breaking his glasses. Gianforte and his campaign lied to the public about the unprovoked violence — they issued a public statement accusing Jacobs of instigating the physical altercation, despite an audio recording that proved otherwise — and we later learned that the Montanan lied to the police, too. Gianforte nevertheless won his election, and after the votes were counted, he pleaded guilty to assault. Donald Trump, who you may vaguely recall having expressed support for law and order, is campaigning now for the convict’s reelection. And the pitch is not “you should forgive him for assaulting a member of the press,” rather, Trump praised the assault, and Republicans at the rally roared their approval. This is not a problem with “tone.” It is actual literal incitement to violence being committed by the leader of the Republican Party. Not for the first time. And he is not alone among Republican leaders in approving of violence against the press. And it comes during a week when Trump has been literally helping the Saudi government cover up the murder of a journalist who worked for the Washington Post. Control of the mass media (by intimidation, among other means) is a defining characteristic of fascism. We should turn out for the coming election, because we literally may not get another chance to vote. Turns out that peer pressure can turn out young people to vote. Who knew? Get the Outvote app for your phone and get texting. 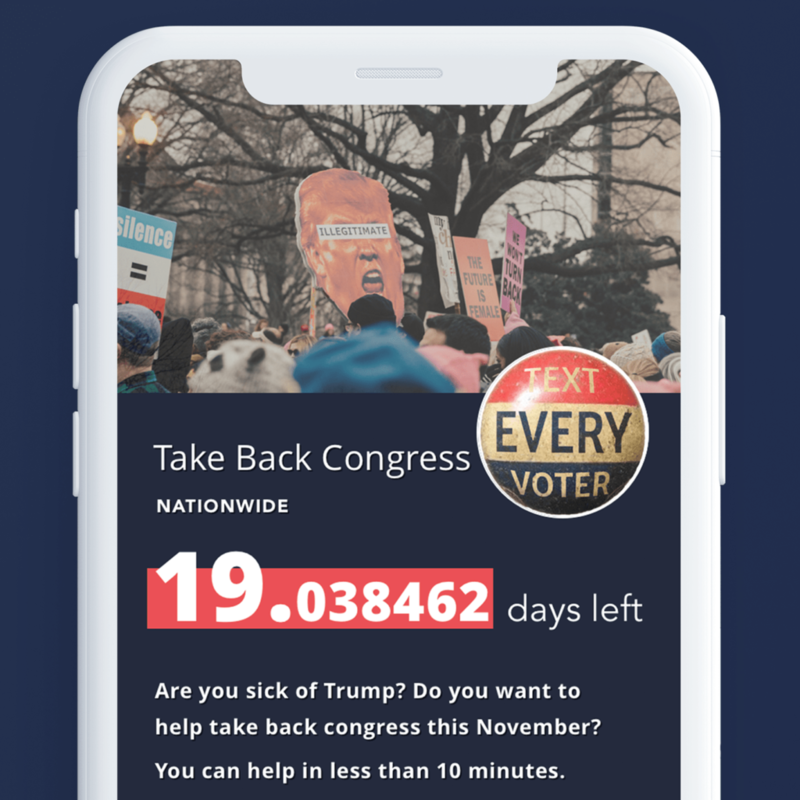 Author Don DoumakesPosted on 2018-10-20 2018-10-19 Leave a comment on Here’s an app that gets your friends out to vote. We already knew our Congressman Steve King is in the habit of palling around with fascists, from sharing social media posts by Nazis and other white supremacists over and over, to taking meetings with fascist leaders. So you will not be surprised that he has now openly endorsed a white supremacist mayoral candidate running in Toronto, Ontario. Why does he do these things? Because Steve King is a fascist. King, we should underline, is a member in good standing of the Republican Party, treated well by Trump and by House Speaker Paul Ryan. He is co-chair of Kim Reynolds’ campaign for Iowa Governor. Because the whole Republican Party is fascist now. There has never been a more important election to turn out for. Vote against Steve King, and for J.D. Scholten. Vote against Kim Reynolds, and for Fred Hubbell. We know that nearly 3,000 Americans died in the aftermath of Hurricane Maria in Puerto Rico. We know that, because the Milken Institute of Public Health at George Washington University did a scientific study based on actual mortality data and death certificates. These facts are not the story that Donald Trump would like to tell. Trump would prefer that the Puerto Rico disaster response be a success story, with himself as the paper-towel-tossing hero. So he is now literally claiming that the Democrats made up the number out of whole cloth, to make Trump look bad. This is a technique called the big lie. And it works, particularly among people who have been told to disbelieve what they read in the press. And, as usual, Republican leaders are complicit in the Dear Leader’s lies. This could be written about Donald Trump today, couldn’t it? But it wasn’t. It was written during World War II, by the U.S. Office of Strategic Services, as part of their psychological profile of Hitler. Soybean farmers are finding out that loyalty to Donald Trump is a one-way street. 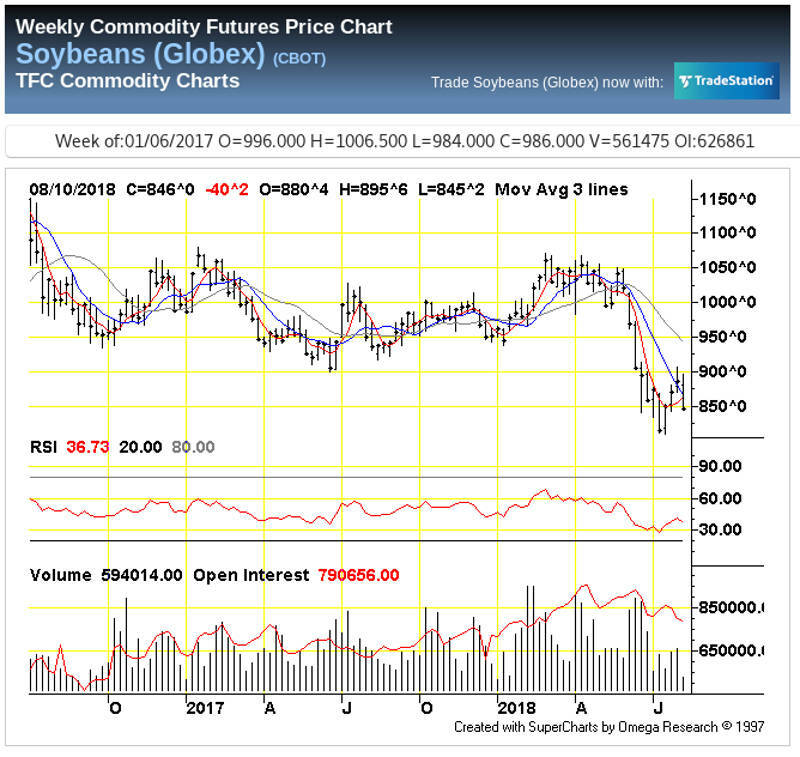 As you can see from the chart below, soybean prices are falling steeply, thanks to the predictable retaliation for Trump’s tariffs. Soybeans were at about $11 a bushel earlier this year, now they’re at $9, which is close to the break-even point for most farmers. That’s not just money out of the pockets of local farmers, that’s money out of the pockets of people who run businesses in this county, and people who work for wages. Republican government has consequences, and here they are right now. Trump’s response to the suffering he deliberately caused, is literally “Don’t blame me for that.” Of course. Why would the guy who said he was going to start a trade war, and then started a trade war, take the blame for the trade war he started? These are not isolated cases, not bad apples, not aberrations. This is the logical end point of the last forty years of Republican politics. You pander to racism, you get a party full of racists. You can’t disavow what you are. Steve West’s shocking and vile comments do not reflect the position of the Missouri Republican Party or indeed of any decent individual. West’s abhorrent rhetoric has absolutely no place in the Missouri Republican Party or anywhere. We wholeheartedly condemn his comments. But apparently West himself does have a place in the Missouri Republican Party, and that place is “winner of the primary election.” How far out of step with the Republican Party could he be, to win by 25 points? Did Missouri Republicans take the obvious next step, do the right thing, and urge voters to support West’s Democratic opponent on election day? Nope. Watch Rachel Maddow explain why Americans should face up to the worst case scenario on the Trump administration. It’s worth watching the whole thing.